The aigosumi joseki is one of the discarded joseki, or used to be. We're talking about this . Jowa used it successfully and there are no weaknesses in it. It was played often around 1820, and then dropped out of fashion, possibly because it was too slow. But Chang Hao played it in 2002. One can guess that increases in komi cause trials to be made of discarded joseki, by White. This pattern can give rise to Kaizen's Heavy Plastering. is a common way to defend when is in place. (Another rarely seen joseki move.) It is sometimes used with a stone at a as well. 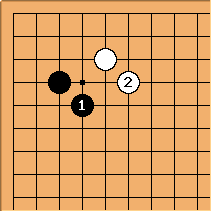 Most occurrences of kosumi against kosumi may not feature this exact configuration, but are related to these examples as most often White has stones along the upper side, many modern examples feature as the border of a framework. It seems it was one of the favourite joseki of Honinbo Satsugen - he used it (with both colours, sometimes with opponent having pincered his 3-5 stone) with great success in all(6 of 6) of his games in sogo against Inoue Shunseki. In the database it looks like recent occurrences are split between Black and White evenly.